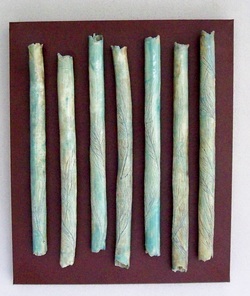 Ceramic tubes mounted on canvas, impressed with native casuarina leaves made in paper clay and fired to earthenware temprature with a green glaze. approx 61 x 51 cm. photo by artist. 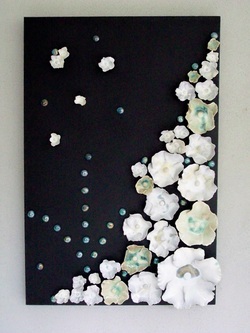 Crystalline glazed hand made stoneware flowers with glass beads high fired on canvas approx 76 x 51 cm. pnoto by artist. 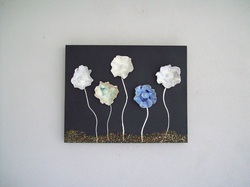 Crystalline glazed handmade stoneware flowers with glass beads high fired on canvas. approx 50 x 40 cm. photo by artist. Crystalline wall tiles set in deep boxes high fired. Each frame approx 16.5 cm sq, tiles approx 9.5 cm sq. sold photo by artist.